Soups are a wonderful judge of a cook. 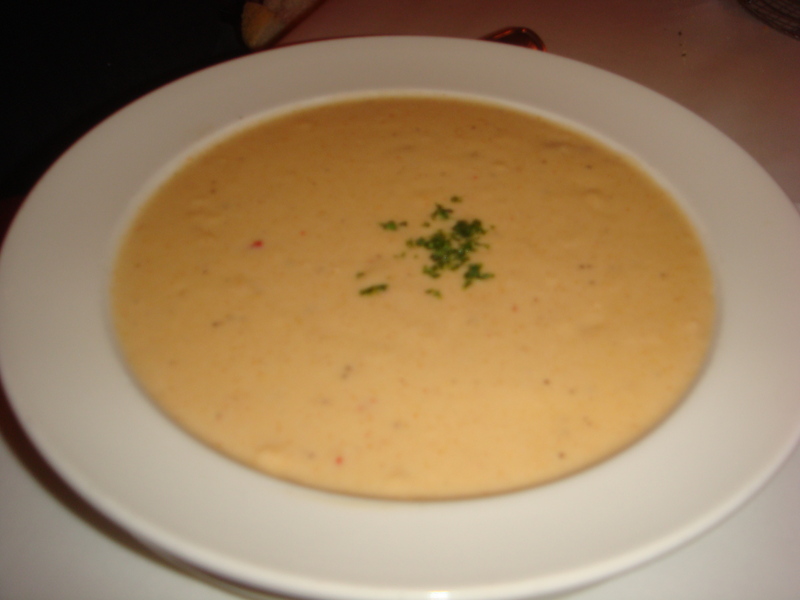 I love a restaurant that serves a homemade soup packed with flavor. Here are some of the best I’ve tried. Clam Chowder from Fresh Chef in Mooresville. Creamy and clearly made with love. The best clam chowder I’ve ever eaten. Broccoli Cheese Soup from Croissants Bakery in Myrtle Beach. Clearly homemade, creamy and cheesy. Is there anything more comforting that good Italian food? So many offerings, but so few get it right. These do. Seafood dishes remind me of vacation. We always go somewhere near a beach and the first thing we do is hit our favorite seafood places. Here are my favorite dishes, some are even inland! 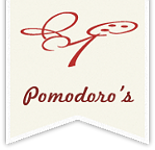 Pomodoro’s is an Italian restaurant tucked into a shopping center in Mooresville. From the outside, the restaurant looks unassuming, but go on inside. It is actually larger than you would think. We arrived at 5:30 pm on a Saturday evening and were seated right away. As we were leaving an hour or so later, there was a line. Come early! This restaurant has a ton of booths. They are straight backed, and looked to be kind of tight. I requested a table since my fused ankles don’t do well trying to get up from the booth. There were only a few in the back, which won’t be a big deal to everyone, but it was to me, so I mention it. The hostess graciously made the change for us with little fanfare. We got a couple of appetizers for the table and both were done very well. The first was the Salt and Pepper Fried Calamari. These are served with marinara sauce for dipping. They were seasoned perfectly, breaded lightly and fried quickly until just done. There was not a tough ring on the plate. If you like Calamari, these are done well. We also got the Bruschetta which was different than I’d had before but so delicious. The bread slices were toasted with olive oil and encircled the pile of sweet tomatoes dotted with basil, parmesan cheese and kalamata olives. All of this was drizzled with balsamic vinegar. I was expecting the bites to be tangy, as I’ve had before, but they were actually very sweet. I loved it. It was easily my favorite appetizer. Also pleasing was how crispy the bread was. The olives provided just enough salty bite to make it all work. All of our meals came with a Garden Salad. This salad was huge! It came with a mixture of lettuces, tomatoes, black olives and shredded mozzarella cheese. All of their dressings are homemade (yes!) and I had the Ranch. It was delicious! The salad was maybe even my favorite part of the whole meal, so fresh and delicious! And I normally don’t like tomatoes, but the one on our salad was canned, and tasted perfect. I’m not sure if they were out of fresh tomatoes or if that is just the way they plate the salads, but it was wonderful! My entrée was the Veal Marsala. I hate to report that it was terrible. The marsala sauce was very sweet and the veal was chewy and inedible. I asked for a serving of marinara sauce for my spaghetti noodles just to be able to finish the pasta. I would not recommend this dish to anyone. However, everyone else had dishes that they loved, so I am still going to recommend this restaurant. Just skip this dish. My friend got the Sirloin Steak con Gorgonzola and said it was amazing. It was grilled to a perfect medium and served atop a creamy Gorgonzola sauce with steamed broccoli and pasta on the side. It looked wonderful! My other friend had Zuppa di Pesce which was a soupy tomato broth filled with sautéed shrimp, clams, mussels, scallops and calamari over fettuccini noodles in a soup bowl. Though the broth was a bit watery on top, the seafood was cooked perfectly. Also, my friend discovered that when she dug from the bottom is was much more flavorful as the garlic bits and spices seemed to gather at the bottom. So, if you get this, and you should, make sure you scoop from the bottom to the top every now and again to distribute all of the goodies. Lastly, my husband got a simple pasta dish of penne pasta with meatballs and marinara sauce. He raved about this dish. The marinara was so flavorful and well spiced, it needed nothing. The meatballs were tender and huge! 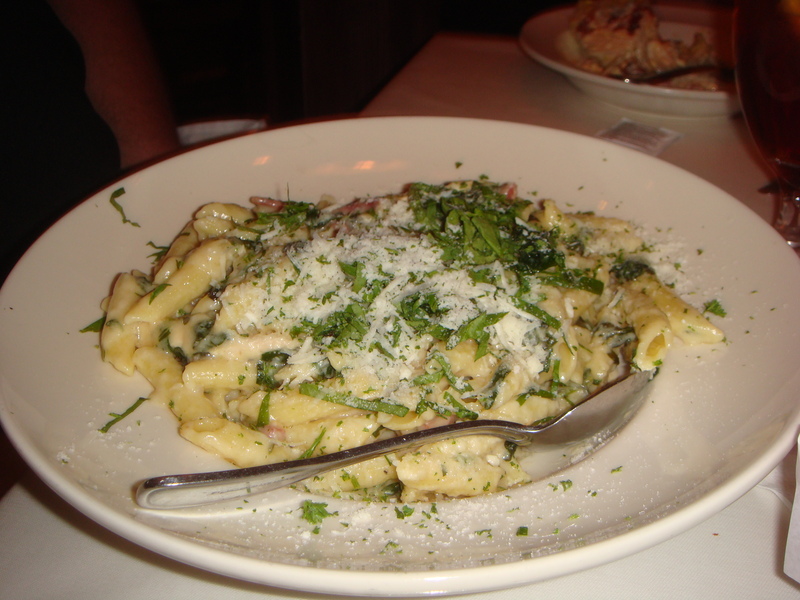 We will definitely be back to Pomodoro’s for another visit very soon. The prices were very reasonable and you get a lot of food for your money. This is truly a hidden gem. After picking up a Radon monitor for my husband in Troutman, the kids and I were starving, but didn’t want to drive all the way into Mooresville proper for some lunch. 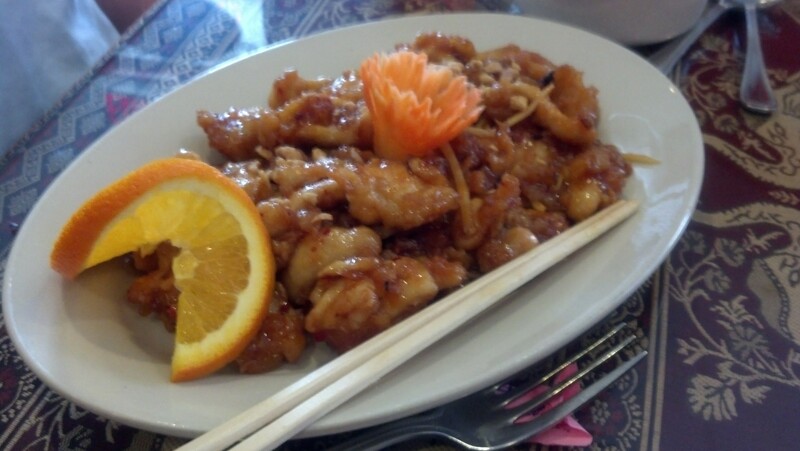 We spied Chopstix as we were coming down Doolie Road, and decided to give it a try. What a wonderful discovery!! 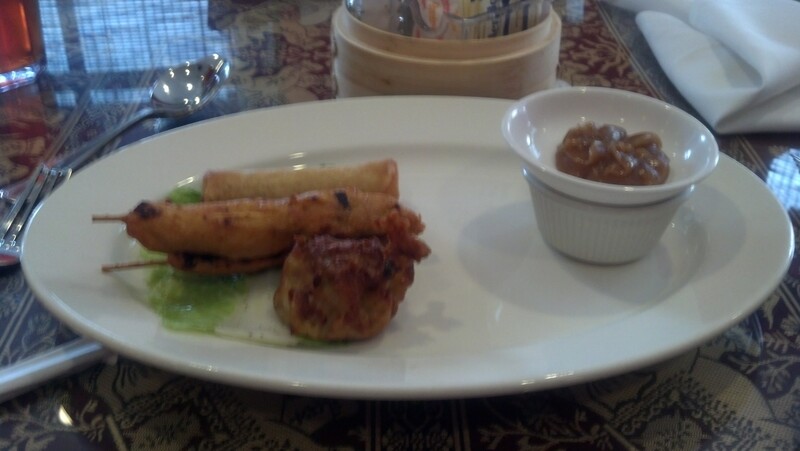 We started with an appetizer called the Chopstix Combination. It had 2 Chicken Satay skewers, 2 fried dumplings and 3 spring rolls. The Chicken Satay was marinated and glazed with coconut cream and served with a sweetly savory peanut sauce that was like the tastiest and smoothest peanut butter I’ve ever eaten. The fried dumplings were full of spicy ground meat and were crispy on the outside. The spring rolls were also delicious. My entree was the Pad Pik Paow with Shrimp. 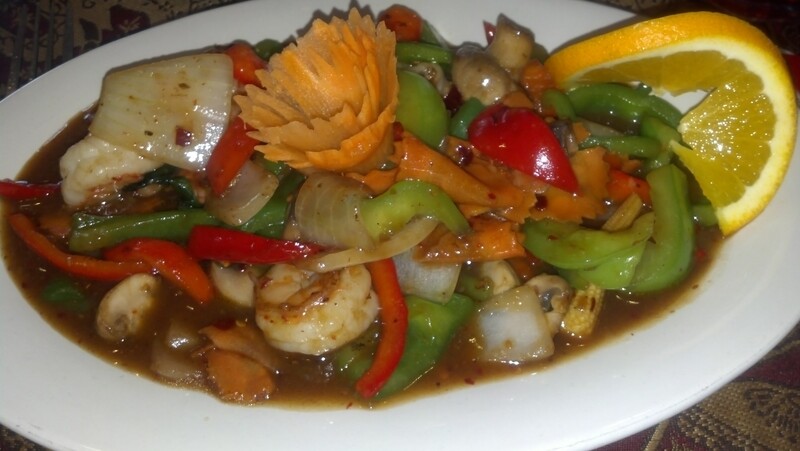 It was a stir fry of shrimp, veggies and flavored with basil leaves and chili paste. It was spicy and cooked well, but I would have liked a little more of the delicious sauce to drench my rice with. My kids both got the Kei Krob which is a battered and deep fried chicken cooked in a Thai sweet sauce mixed with sliced ginger and crushed peanuts. I was surprised at how delicious this was! It is possibly the most delicious sweet chicken dish I’ve ever had. 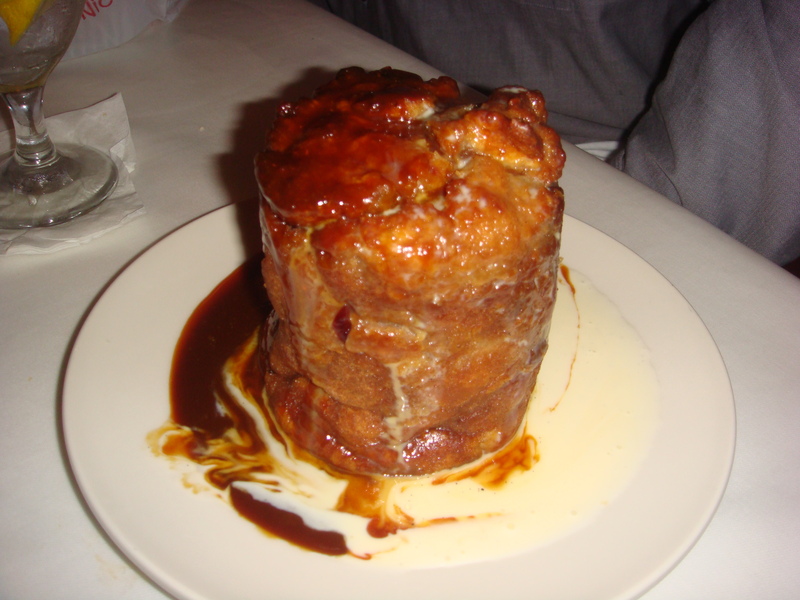 It had such a balance between the sweet sauce and the savory elements of the dish. That is an easy dish to get wrong, with a sauce to cloyingly sweet. It is perfect here. 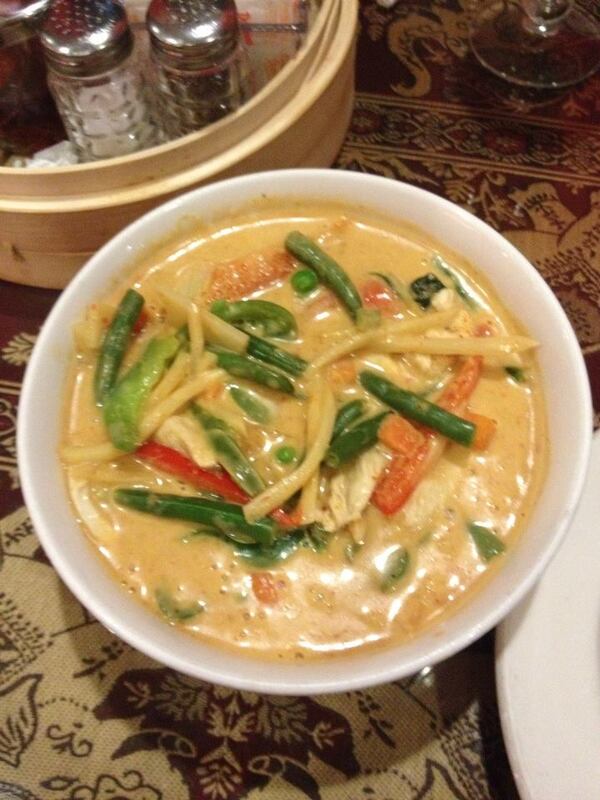 The red curry with chicken is creamy and spicy and is loaded with crisp vegetables and tender chicken. It’s yummy even the next day! This has become one of our favorite restaurants in Mooresville! My husband and I have found a couple that love to explore the area’s restaurants, just like we do! We try to go out on Friday nights to enjoy each other’s company and try a new restaurant. 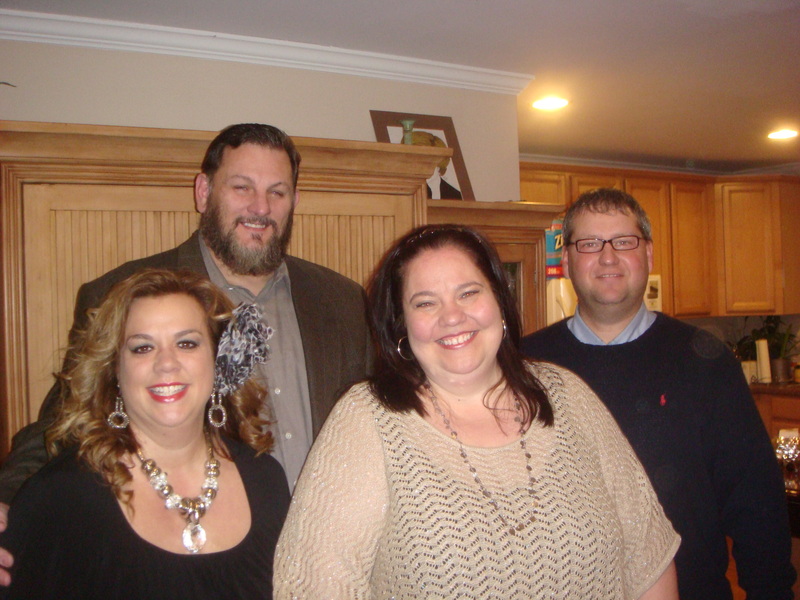 It is so much more fun with the four of us foodies together! 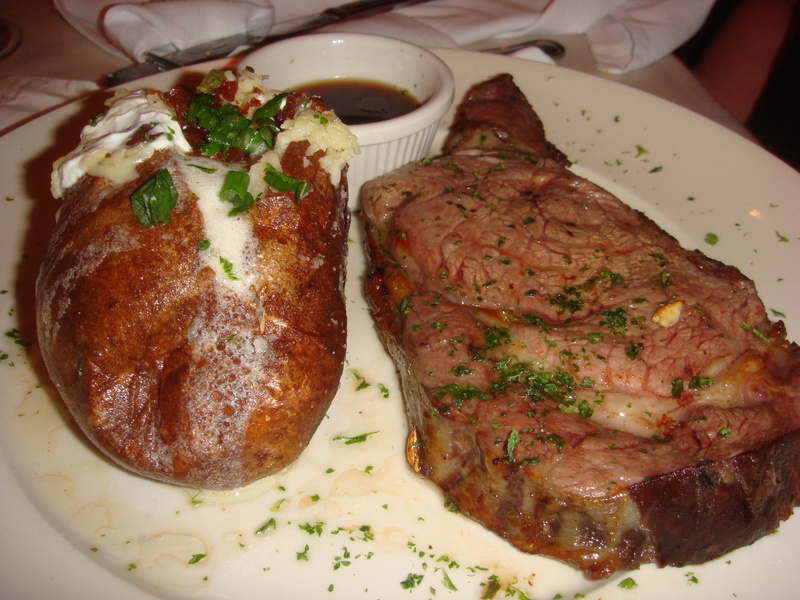 One of our most recent visits was to the Epic Chophouse in Mooresville, NC. Amazing. See, that’s them! Hi Jeri and Robert! Appetizer #1 selected was the Epic Chophouse Cheese Toast. This is a special 4-cheese spread that they spread onto house made slices of toasted french bread and broil until golden brown. It was tangy and addictive. My other diners weren’t as thrilled with it as I was, but I appreciated its creamy tang with each bite. 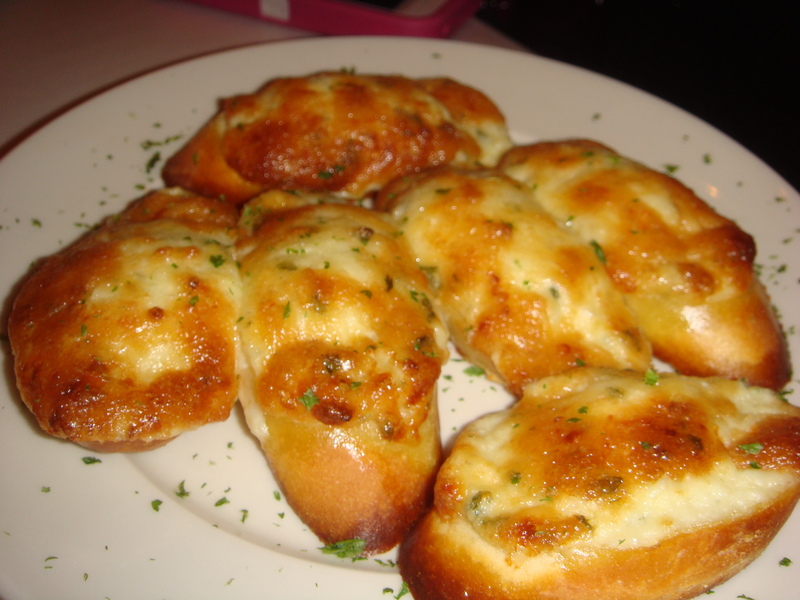 A great appetizer to share! This was our friend’s appetizer: Shanghai Shrimp. It was a special that night, and not available on the regular menu. Which is a huge bummer, because this was beyond amazing. This was the hit of the night. At the STEAKhouse. This portion had 9 jumbo shrimp, lightly fried and doused with this sweet and hot creamy sauce with Asian spices. 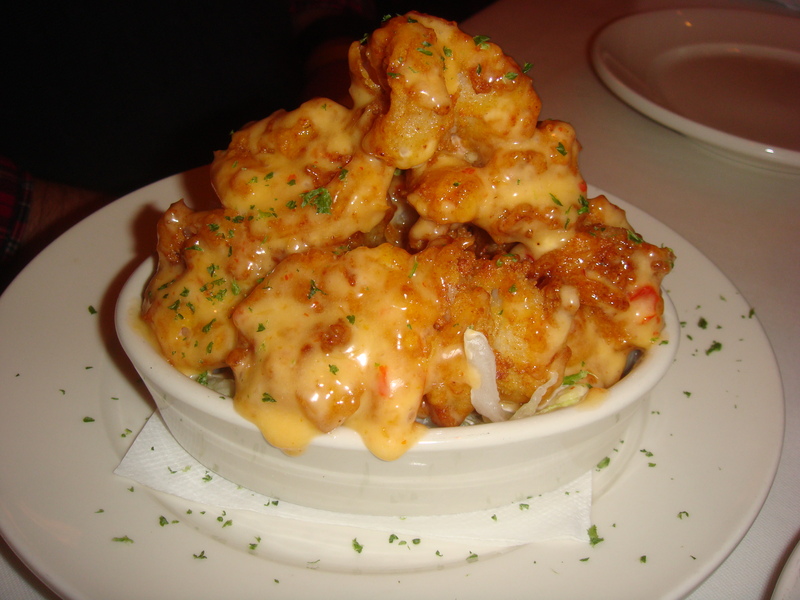 It reminded me very much of Bonefish Grill’s Bang Bang Shrimp. For the next course, one of my dinner mate’s got the Lobster Bisque. It was velvety smooth, creamy, not too thick and had excellent flavor. Barely adorned with fresh herbs, it needed no gilding because it was perfect in its simplicity. This wedge salad was my second course. It proved to be way more than I could eat, but what I did finish was pretty darn tasty. 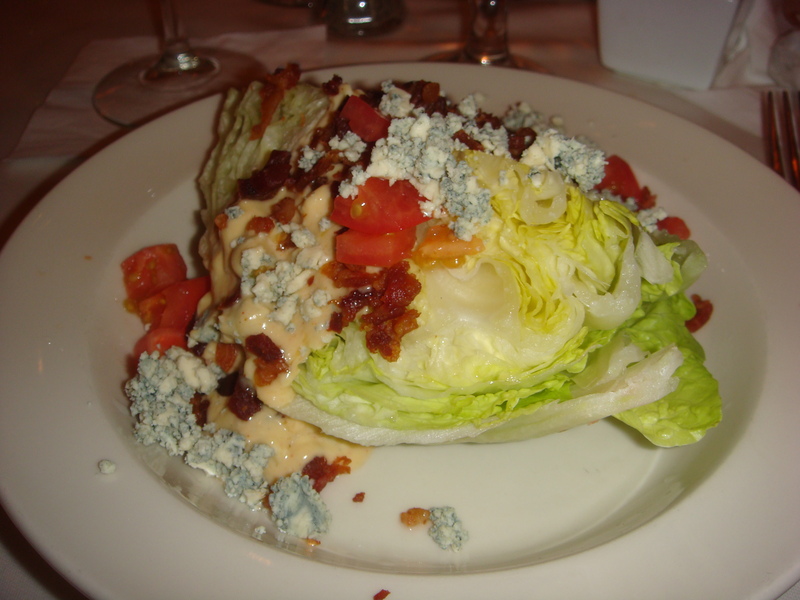 It is simply a quarter head of an iceberg lettuce, topped with crumbled bacon and bleu cheese, chopped tomatoes and then drizzled with their very tangy bleu cheese dressing. My only critique would be that the dressing was a touch too tangy for me, but then I like the traditional bleu cheese dressing that is white and mimics Ranch dressing. This, however, was fresh, delicious and plentiful. This is a photo of my friend’s Prime Rib. She let me have a bite, and it was perfectly cooked for her and well seasoned with pepper. The Au Jus was flavorful and bold as well. If I was choosing, I’d say my hubs got the best meal of the night. 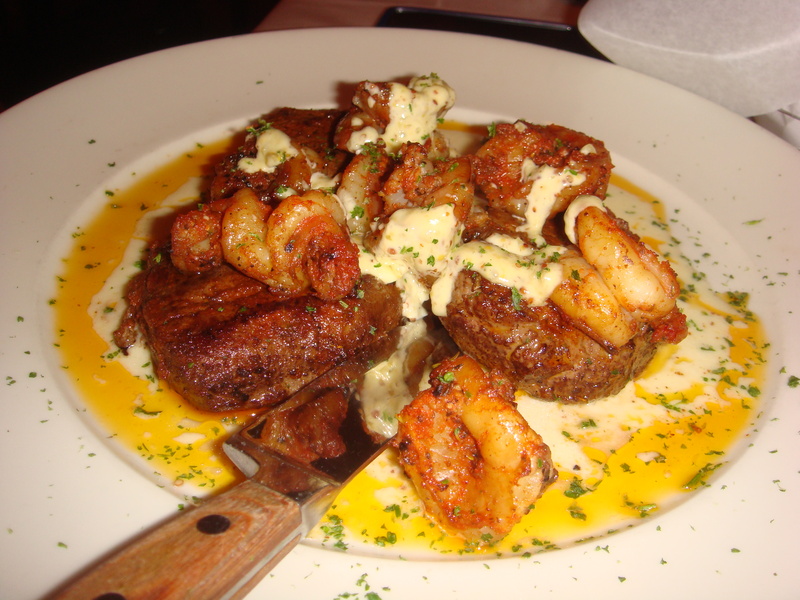 His dinner is called “Smoking Hot Couple” and it is 3 aged beef filet medallions topped with 8 (seriously) Jumbo shrimp seasoned with a smoky Cajun spice. All of this blackened and served with a light herbed butter sauce and topped with a Cajun Remoulade. The steak was like butter. Absolutely cooked to perfection! The shrimp were plump and cooked well and spiced goodness. I will be getting this the next time we go, which I hope to be very soon. 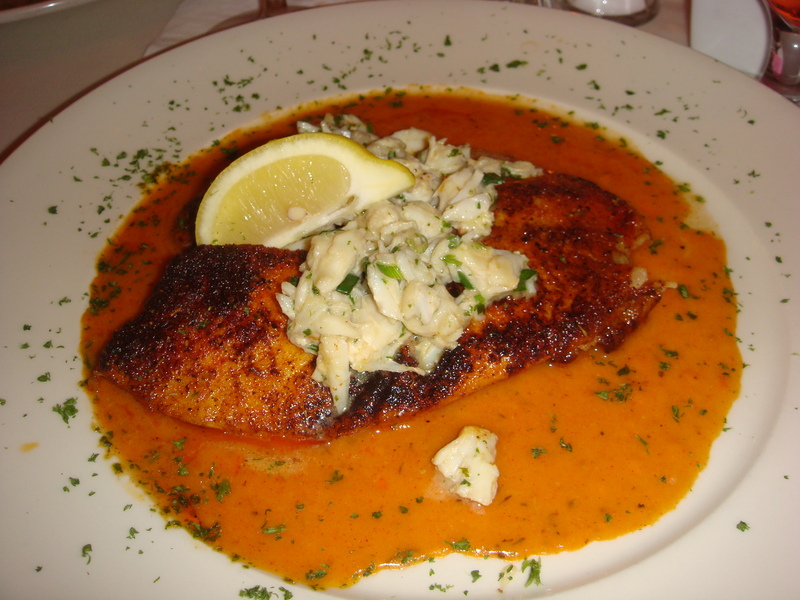 My entrée was Skillet Blackened Tilapia with Jumbo Lump Crab. The Tilapia was a mild fish that had a spicy seasoning and blackened to perfection. But…my favorite part was the butter poached crab on top. It was velvety smooth and melted in my mouth. Seriously. The sauce that you see pooled around the bottom of my fish was a Cajun Cream Sauce, and it was rich and packed with flavor. It was amazing. I got mine with a side of garlic mashed potatoes. They were creamy and hearty. Another entrée sampled by my fellow diner was a special that night. It was a chicken alfredo dish which Robert reported was creamy and rich and the chicken well-seasoned and tender. 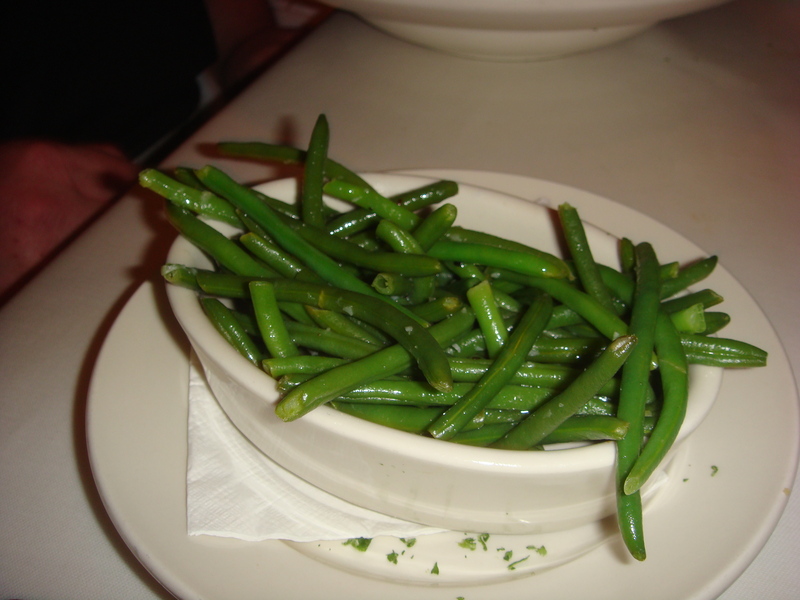 He got it with a side of fresh green beans. Those were a little underwhelming. Yes, in spite of the enormous amounts of food we ordered, we still needed dessert. Don’t judge. 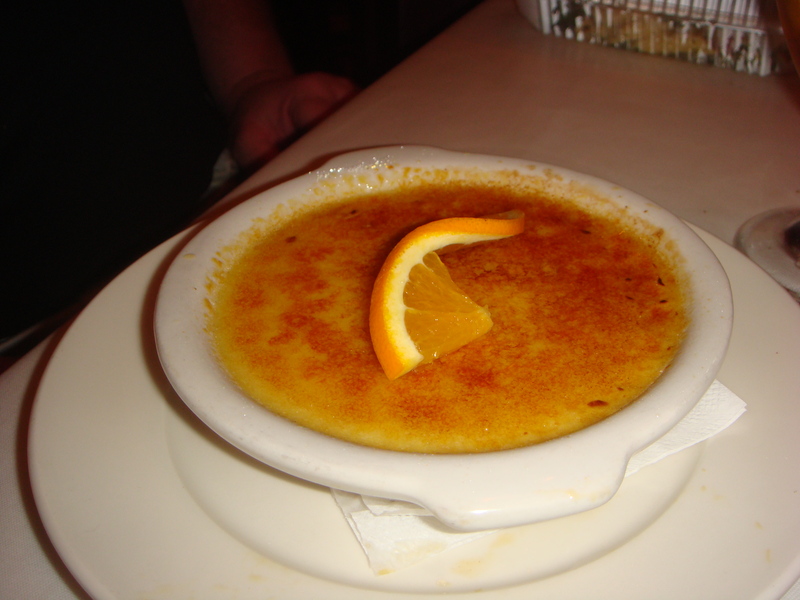 Robert got the orange scented Creme’ Brulee. As always, it was the best of the night as no dessert on Earth will ever compare to its luscious richness. So, why isn’t it my dessert? Because I am adventurous. And stupid. 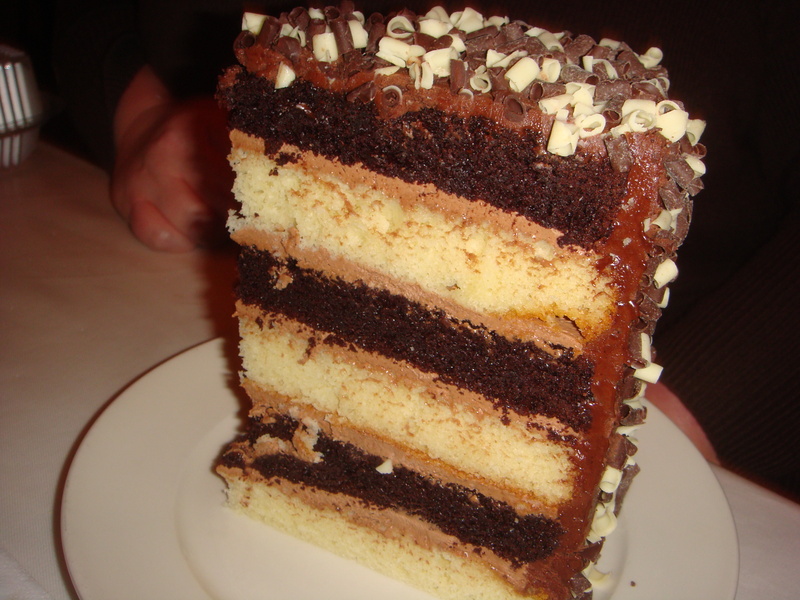 I ordered what was supposed to be the signature dessert here: the Six-Layer Chocolate Cake. Looks good, right? It was ok. 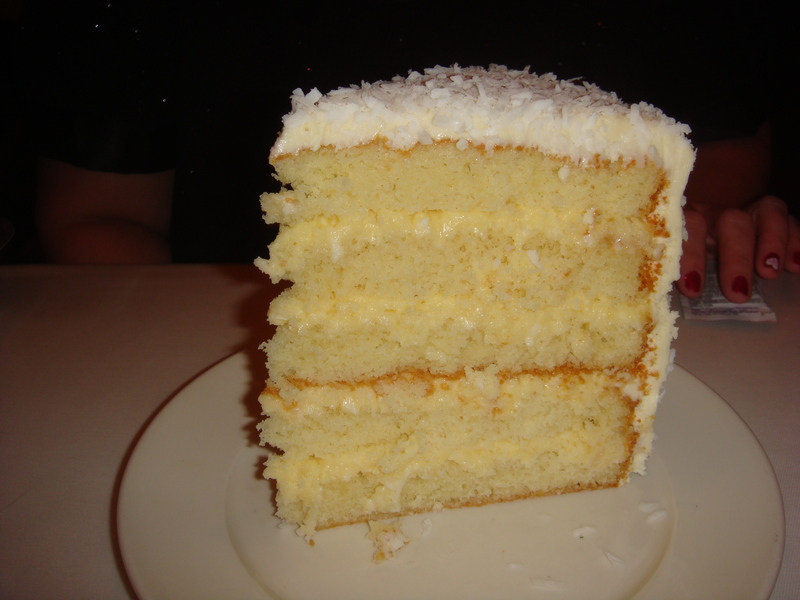 I found the cake to be a little dry for my taste, and certainly cumbersome because of its towering size. I brought home about 2/3 of it, and found it to be a much better snack over the next day or so. I’m not sure if you can get this little gem every night, but you should. It is amazing. This delicious Coconut cake is moist and packed with creamy coconut flavor. Simple and perfect. Now, you’ve seen all of the pictures, and listened to me wax poetic about the food, but here’s maybe the most important thing: The owner cares. Yep, that’s it. He gives a darn what kind of experience you have. I’ve researched this restaurant, and he responds to any review that lists a less than stellar experience with a sincere desire to learn and do better next time. If you have that kind of passion, and show it, then I’m going to forgive any missteps made in my meal during the night. I cannot wait to get back! OK, so we went back and I have more dishes to share. We 4 duplicated some of the dishes but anything new I photo’d and will review for you here! 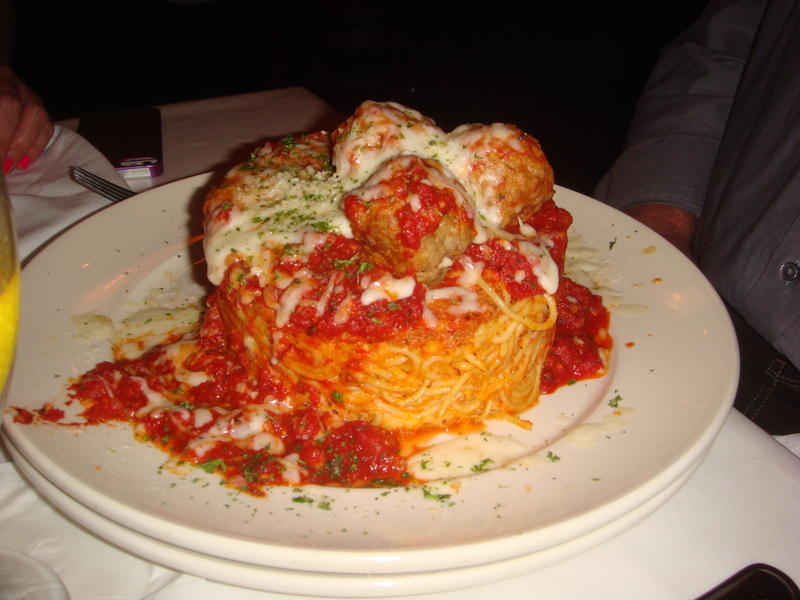 This time my husband got the spaghetti and meatballs. Bad move. Though the towering pile of pasta was plentiful, there was a tang of vinegar in the sauce that completely overpowered the marinara. He couldn’t even eat it the second day. That dish needs a major rework, chef! 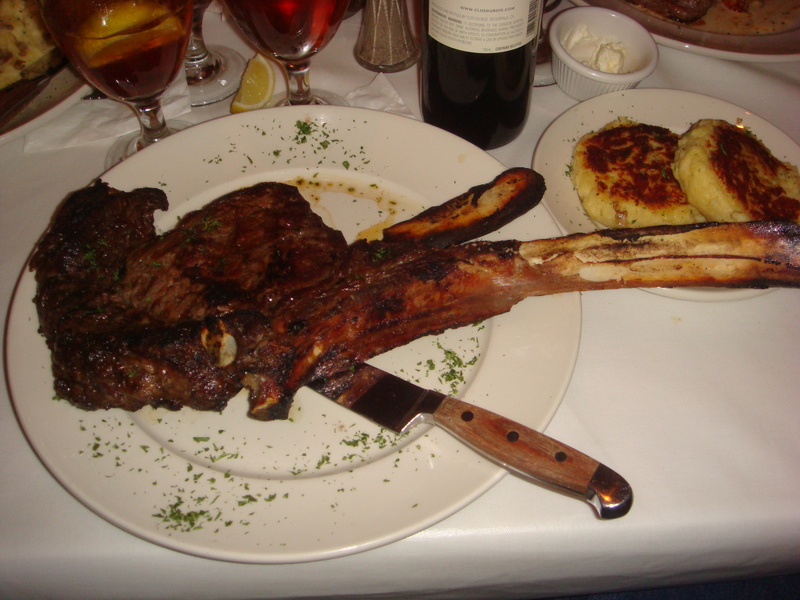 My friend got the huge Tomahawk steak, and on that night they said it would take an hour to get it. We agreed, we were in no hurry, and they got it out to us sizzling and juicy in less than the promised hour. Robert reported it to be very tender and delicious. The only different dessert was our bread pudding. It was huge, but more is not always…more. It was dry and the caramel it was drizzled with had a burnt taste. I brought it home and it didn’t get better with age. Here’s another dessert for you to re-work, Chef. Next time, Creme Brulee all the way.